Are you future ready? More than one third of all working adults don’t have a pension, and of these, 64 percent plan to rely on the State pension when they reach retirement, Zurich’s pension research reveals. More than a third of all working adults don’t have a pension, with 61 percent pointing out that lack of spare money is the main reason for not having one. Some 40 percent of those who have no pension, plan to start saving in one to five years, but equally, the same number also feel it is too late to start saving for retirement at this stage in their lives. In addition, 71 percent don’t have a financial advisor or broker to discuss financial planning with*. 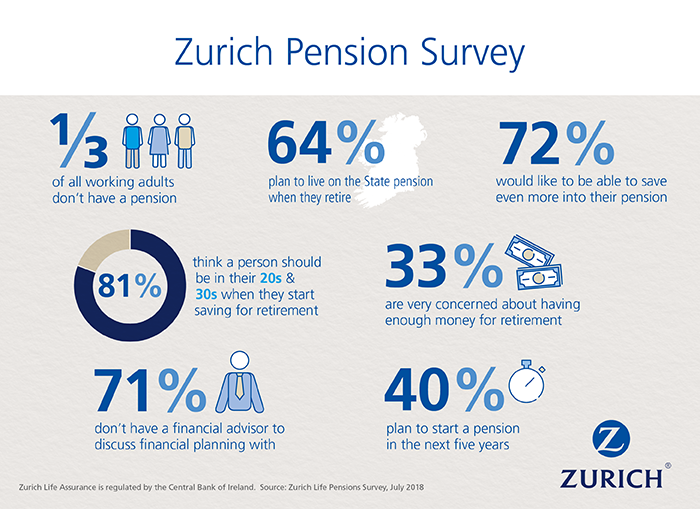 These stark findings are revealed in Zurich’s latest research into pensions in Ireland. The comprehensive research study also throws a spotlight on the concerns many people have about their future and how they will maintain their standard of living when they retire. Almost every third worker is very or extremely concerned about having enough money for retirement and most feel the sooner one starts saving into a pension fund, the better. Of those surveyed, 81 percent said that a person should be no later than in their 30s when they start saving, but almost half of all respondents think the best age to start saving for retirement is in your 20s. Zurich’s pension study reports that nearly half of all working adults who don’t have a pension, think it is too late to start saving for retirement at this stage in their lives. Unsurprisingly, the majority of people who think this are in the 55+ age category. In contrast, 36 percent feel the time is just right to start saving for retirement, and the majority of people who expressed this view are 18-34 year-olds. Currently, the State pension in Ireland is €243.30 weekly**. Of those surveyed for Zurich’s pension research, 27 percent said the annual income guaranteeing a normal life in retirement should be in the region of 20k-30k. However, for all those aged over 55, they stated that the income needed in retirement should be more than 40k per annum. More than seven in 10 of all working adults who contribute to their pension each month would like to be able to save even more. When it comes to understanding how pension savings are invested, 58 percent said they are not familiar with how pensions are invested – and this was more pronounced among the younger demographic of those surveyed. When asked if you would be more inclined to start a pension if you could access your money before retirement in certain circumstances (e.g. to pay for a house deposit or in case of redundancy), seven in 10 said that providing access to funds before retirement would be a motivating factor for starting a pension. In addition, almost half of those surveyed were not aware that part of their pension funds can be taken tax-free upon retirement.